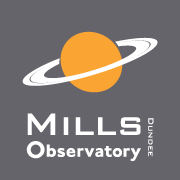 Everyone is invited to join the astronomers at Mills Observatory for this one of their regular free weekday evening open nights through the Winter season (October 2018 to March 2019). With free admission and free parking these events offer a fantastic family evening out and great value too! No booking required -- just turn up! No booking is required for these events, simply turn up on the evening!